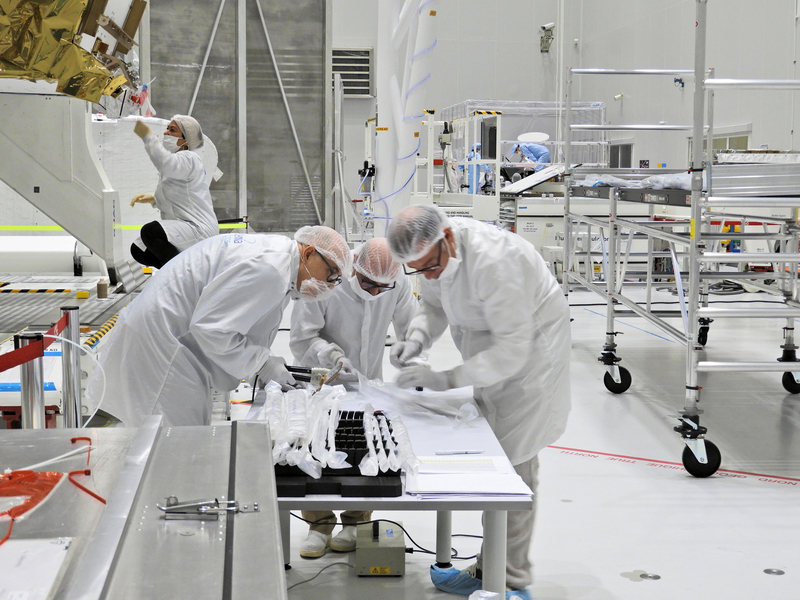 Engineers inspect individual radiator fins that will be attached to the BepiColombo Mercury Planetary Orbiter (MPO). The 3.7 m wide radiator is specially designed to reflect heat directionally, thus allowing the spacecraft to fly at low altitude over the hot surface of the planet. Heat generated by spacecraft subsystems and payload components, as well as heat coming from the Sun and Mercury and 'leaking' through the thermal blankets into the spacecraft, will be carried away to the radiator by heat pipes. At top left in this photo the Mercury Transfer Module (MTM) is partly visible and behind it the Magnetospheric Orbiter Sunshield and Interface Structure (MOSIF). The MPO stands in the background to the left, hidden from view by precautionary blast shields. Also in the background, but to the right, the Mercury Magnetospheric Orbiter (MMO) can just be seen with its white circular high-gain antenna at the top of the module.